Heating and cooling systems are commonly easy to maintain. Regularly maintaining your unit results in efficient operation. It does not matter what kind of heating and cooling unit you have, there are many things to help keep your unit in tip-top shape. You need to have some materials and tools like a flashlight, pliers, screwdrivers, wrenches, level, hammer, rags, newspapers, brushes, as well as a vacuum cleaner. You will also require some specialized materials like fan belt dressing, motor oil, duct tape, and refractory cement. You can find all these in home improvement centers and local hardware stores. Once a heating and cooling system fails to function properly, the cause of the problem could be at least one of these three: thermostat, distribution system, and heat or cold source. In case the air conditioner or the furnace does not work, the problem could be at the source. Maybe the air conditioner or furnace lost power or the fuel might be reaching the unit. In case your fuel is oil or gas, the problem could be because it is not igniting. In case the air conditioner or furnace switches on but the cool or warm air fails to reach the different rooms in your home, the culprit could be the distribution unit or perhaps the blower. A faulty thermostat or control could prevent the system from turning on or it could trigger it to keep on turning on and off on its own. Regardless of what issue is at hand, always begin with the simplest procedures. Of course, you need common sense and patience. 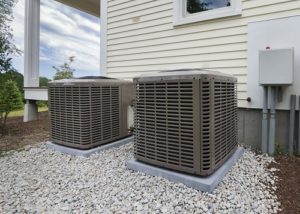 Before you begin working on a Florence heating or cooling system, there are some preliminary steps you need to take. The unit must be getting power. Search for tripped circuit breakers or blown fuses at the main entrance panel. There are a few furnaces that have a separate power entrance, typically situated at a different panel close to the main entrance panel. Meanwhile, a few furnaces have fuses installed in or on the system. In case the unit has a reset button, wait for half an hour to allow the motor to cool down and then press that button. In case the unit fails to start, wait for another half an hour and press the reset button once again. Do it again at least once more. In case the unit has a different power switch, be sure that the switch is turned on. Inspect to make sure that the thermostat was set properly. In needed, lower or raise the setting by five degrees. In case your unit uses gas, be sure that the gas supply is switched on and the pilot light is illuminated. In case it uses oil, there should also be enough supply of oil into the system. Call Florence HVAC Experts if you need help in installing, repairing, or maintaining your heating and cooling unit.